Blue Key Login - Login by plugging your U2F FIDO Yubico Key. Login by plugging your U2F FIDO Yubico Key. Only an administrator can install the Blue Key Login Provider, and also only an administrator can edit credentials used for login to the PC. Any user can use the login provider to login. If the user wishes to add credentials to login to another machine, they can do it without admin privileges. Blue Key Login stores passwords in order to login. It stores the password in a secure way, but no storage method is 100% secure. Use at your own risk. When saving remote-credential information, the file that is created in the stick is only readable from the computer it is created from and only from the user that created that information.Even if you manipulate the file permissions to read the file from another computer or account, it will be useless since it is encrypted using information from the computer and the account it is created from. You may want to install the x86 version also in a x64 system, if you want the login provider to be accessible from 32-bit applications as well. If you only need it to login to your PC, you only need the native x64 version. Blue Key Login is portable. You can run it from wherever you want. 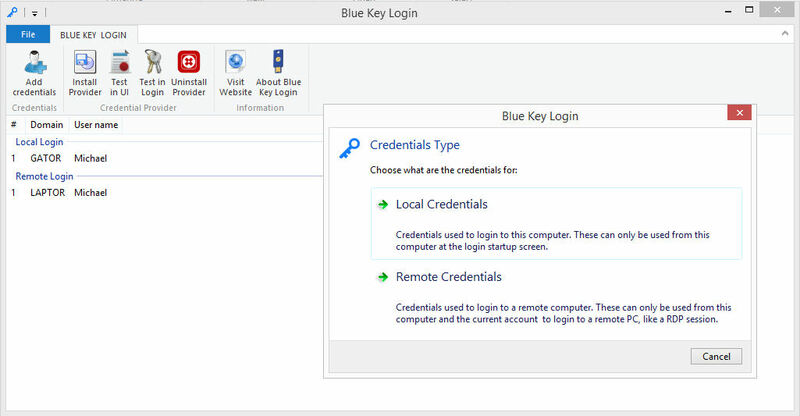 It creates users and provider information in the system directories and it accesses your first available Blue Key stick. Remember to read information and security considerations - Blue Key Login is a 2-way authentication mechanism, so your passwords are stored. Insert a Yubico key, Blue Key Login should recognize the stick and detect it. It shows all HID devices in a panel to the right, make sure there is only one HID device or a "selected" entry. If there are more than one HID devices, Blue Key Login selects the first one with 4176 VID (Yubico). If automatic detection could not be done, please double click the HID entry you want. Press the Add credentials button. You may choose between login to PC credentials (which requires Admin privileges) and login to other targets (such as RDP sessions). Either select an existing user for the same PC, or you can add manually the information (for example, if saving for another computer). To delete a user, select the user and press the Del key. Press Install Provider button to install the login provider. Test your provider by clicking the Test Provider button. To uninstall the provider, press the Uninstall Provider button. Note that the passwords are stored in an encrypted way. If you lose your login ID (for example, if you reinstall Windows), the Blue Key will be useless to login even if the credentials are the same. You must remove the credential file in the Blue Key stick and create it again.